The best solution to the dullness that happens overtime on concrete patios is using paver bricks to cover it. This method is simpler than laying pavers or pouring concrete in the usual way. The process is not complicated and requires less time to complete. If you want to actualize this patio design, please give us a call on 916-571-0908 for more information. Paver bricks over concrete slabs work for most environments and they have minimal risks of chipping and flaking. We provide all the necessary materials. 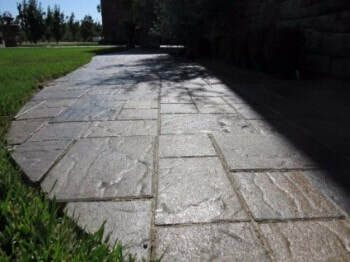 We select the most appropriate combination of pavers taking into consideration the thickness for border pavers which should be 0.75’’ thicker than the rest. Borders need extra thickness to hold a bed of sand in the field. The volume of pavers is dependent on the square footage of the entire bed. The border area needs to be prepared first and glue applied to form a strong bond. The border pavers should be at least 0.25” from the house. Pavers are laid in a row and arranged neatly. They don’t have to reach the end of a patio though. Call 916-571-0908 now for free quotes and estimates. The landscape fabric is laid first followed by sand. It is very important for concrete patio contractors. The fabric prevents loss of sand through cracks. After the screed pipe is positioned correctly, sand is spread evenly. Screeding involves a lot and a professional contractor needs a helping hand. The sand is covered with pavers and once the site is complete, the border pavers are glued down. The field is then tamped with a compactor to the gaps between pavers filled with sand. Final touches include sweeping excess sand and trimming the landscape fabric. Concrete patios are one of the most practical outdoor landscape designs. They can be plain or decorated in a number of techniques and finishes. These surfaces require regular maintenance to prevent staining and cracking. We will help you install brick pavers over concrete patio if you request our service on 916-571-0908.